A Venezuelan man who migrated to Colombia one-and-a-half-year ago makes handicraft items with obsolete banknotes. Edixon Infante, 24, is among the growing number of migrants in Colombia, who are using the now defunct Venezuelan bolivar currency notes, to create art. They were replaced by the new Venezuelan sovereign bolivar last August in the face of hyperinflation. Many Venezuelans who migrated to bordering Colombia in the pursuit of jobs and better lives now look after their families selling bags, ornaments and toys made of the abandoned currency notes on the streets. Speaking to Anadolu Agency, Infante said that he worked as a hawker in Venezuela. "If I had this money in the past, I would have been a millionaire. I would buy a house, get a car," Infante said, waving a bundle of banknotes. But it has no value now, he adds. 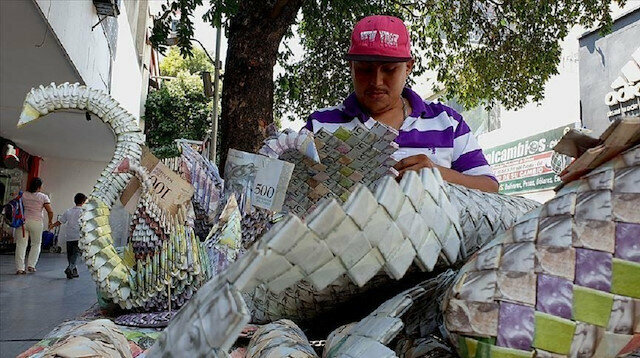 He said he got the idea by some of his country people who were making a living selling paper goods made of old bolivars. In particular, the handicraft goods drew the interest of tourists, said Infante, adding that he sends a part of the money that he earns to his family living in Venezuela. Venezuela's economy has been in precipitous decline following a global downturn in the price of crude oil, the country's main export. The country has been rocked by protests since Jan. 10, when Nicolas Maduro was sworn in for a second term following a vote boycotted by the opposition. Tensions flared when opposition leader Juan Guaido declared himself acting president on Jan. 23, a move supported by the U.S. and many European and Latin American countries. Democratic presidential hopeful Bernie Sanders has called for the U.S. to follow New Zealand's lead in banning military-style assault rifles.On Wednesday, New Zealand enacted a ban on all such weapons following a recent terrorist attack on two Christchurch mosques that left at least 50 dead. "This is what real action to stop gun violence looks like. We must follow New Zealand's lead, take on the NRA and ban the sale and distribution of assault weapons in the United States," Sanders, who is seeking the 2020 Democratic nomination, wrote on Twitter Wednesday, referring to the powerful National Rifle Association lobbying group.Sanders, along with many Democrats, has long called for the U.S. to overhaul its firearms laws following a series of mass shootings that have repeatedly devastated the nation.But U.S. lawmakers have so far been reticent to re-enact an assault weapons ban despite the mounting death toll from attacks in which that type of weapon is commonly used, in part due to opposition from the NRA.The U.S. had banned the manufacture of assault weapons for civilian use in 1994, but the law lapsed 10 years later when it was not extended.Following its own horrific mass shooting, New Zealand Prime Minister Jacinda Ardern said her cabinet agreed to overhaul the country’s gun laws, adding her government will ban "every semi-automatic weapon used in the terror attack".At least 50 Muslims were killed and as many injured when Australian-born Brenton Tarrant, 28, entered the Al Noor and Linwood mosques in Christchurch and shot indiscriminately at those inside.Tarrant has been charged for the massacre and is being held at a maximum-security prison in Auckland.Among the victims were four children under the age of 18. Other children are still being treated at local hospitals for injuries they sustained during the attack. The European Union had around 182 million hectares of forests and other wooded land in 2015, corresponding to 43 percent of its land area, the bloc's statistical office said Thursday.The latest available data was released by Eurostat on the occasion of the International Day of Forests to "raise awareness of the importance of forests of all types". "Wooded land covers a slightly greater proportion of the land than the area used for agriculture (some 41 percent)," Eurostat said.The statistical office noted that in seven EU countries, more than half of the land area was wooded in 2015.Across the 28-member bloc, Sweden reported the largest wooded area, with 30.5 million hectares.It was followed by Spain, with 27.6 million hectares, and Finland with 23 million hectares. "Of the total area of the EU covered by wooded land in 2015, Sweden and Finland together accounted for 29.4 percent," Eurostat said.The report also revealed that Turkey had nearly 22 million hectares of forest and wooded land in 2015, putting the country in fourth place compared to the 28 EU member states.